What’s More Deadly to Mexicans than the Drug War? Diabetes. Alyshia Gálvez is a cultural and medical anthropologist and professor of Latin American and Latino Studies at Lehman College of the City University of New York. 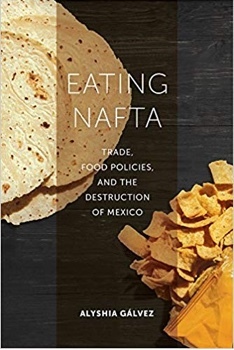 She is the author of a new book entitled, Eating NAFTA: Trade, Food Policies and the Destruction of Mexico (UC Press, 2018). She was the founding director of the Jaime Lucero Mexican Studies Institute at CUNY and is the author of two previous books on Mexican migration, Patient Citizens, Immigrant Mothers Mexican Women, Public Prenatal Care and the Birth Weight Paradox (Rutgers University Press, Oct. 2011) and Guadalupe in New York: Devotion and the Struggle for Citizenship Rights among Mexican Immigrants (NYU Press, Dec. 2009). While the details of the US, Mexico, Canada Trade Agreement (USMCA), informally known as NAFTA 2.0, are still being analyzed, some are breathing a sigh of relief that their interests appear to remain protected. For dairy producers, soy and corn growers, automobile manufacturers, and corporations, the new deal either retains or expands the access to markets they enjoyed under the earlier trade agreement, NAFTA, which went into effect in January 1994. But “we” are not those interests. Few of us own consolidated commodity grain farms, large scale dairy lots, or corporations. Most of us, the working people in the US, Mexico, and Canada who are not directly engaged in those industries, may have a sense that what President Trump has called a win will have a vaguely positive impact on jobs, prices, and the economy in our country, but we probably think it has nothing, really, to do with us personally. However, USMCA, and NAFTA before it, actually have a very crucial role in determining what is on our plates, and our overall health and well-being. Globalization around the world has been associated with a rise in noncommunicable chronic diseases. Every major trade deal results in higher rates of obesity, diabetes, heart and kidney disease. The number one killer today in Mexico is diabetes, with the disease claiming as many lives each year as the drug war has claimed all together. But lest we think only Mexico is paying the price, diabetes and obesity rates have also risen in the US and Canada since NAFTA, along with rates of other noncommunicable diseases. This is not only because trade deals make some things cheaper (soda, snacks, ultraprocessed foods), they also make other, healthier things more expensive. Growers of so-called “specialty crops,” such as fruits and vegetables, and makers of anything produced in small scale operations, tend to find themselves at a disadvantage when global trade expands. Deals like the USMCA favor large scale production. Not only car parts and computer components are produced in factories, global trade favors the production of tomatoes, cucumbers, pork and corn in factory-like conditions, often with lots of chemicals, patented inputs, and technology. The environmental and health impacts of massive proliferation of pesticides, herbicides, diversion of water, and reduced biodiversity as a result of industrialized food are wide and still being understood. Sustainable, small-scale agriculture withers without distribution channels, subsidies, or favorable market conditions, their products relegated to small, sometimes elite farmers’ markets, higher priced and harder to get than the processed foods favored by trade deals and expanded transnational distribution. Our food system pushes us toward eating more and more processed foods, and fewer local products, not only losing the health benefits of fresh foods, but missing out on the rich diversity that formerly characterized regional diets. Agriculture Secretary Sonny Perdue praises the way the USMCA agreement “cracks open” some of the remaining protected markets in North America. The new trade deal expands dairy production and distribution in North America: exactly the kind of accelerated consolidation and mechanization that has triggered a wave of suicides among US dairy farmers. USMCA makes it easier for US corn to reach Mexican markets, even though Mexico already imports $3.2 billion of US corn each year, and 41% of its food overall—a trend that pushed 10% of Mexico’s population, many of them corn growers, to migrate to the US in the first fifteen years after NAFTA 1.0 went into effect. But there is nothing inevitable about the shape that trade takes. USMCA and NAFTA before it are largely a product of corporate wish lists and specifications. These deals are hammered out behind closed doors by negotiators appointed by the executive branch, and armed with “Fast Track” authority. This arrangement is a response to the idea that if every member of Congress had a chance to weigh in, the deals might never be made and they would be padded with special protections for powerful members’ noisiest constituents, threatening the logic of free trade. But corporations through their lobbying efforts and massive PR machines make their wishes known. Logics of free trade and the expansion of markets should not trump democracy, and its logic: the common good. Because most of us think trade deals have nothing to do with us, we don’t demand a seat at the table or question the legitimacy of fast-track, closed-door negotiating in a democracy. Now, even though the deal has been outlined, it still has to go before Congress, our elected representatives, for a vote. If we realize that our health is at stake, we might want to know what’s going into the deal and whether anyone at the table considered our health, environmental sustainability, and well-being. A better trade negotiation would include people like us at the table, citizens whose health is on the line.